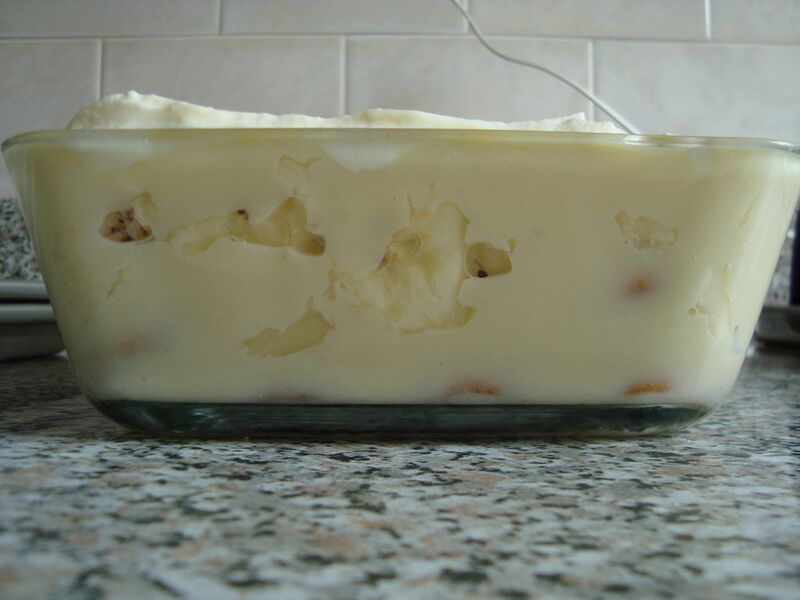 Comfort Food II: Banana Pudding | Marina Cooks, Inc.
And now, the second installment of the Comfort Food series. Generally, my desire for salt outweighs my sweet tooth, so my comfort foods tend to be savory. Pudding is a major exception: I just love the texture and sweetness of pudding. Especially vanilla pudding. Growing up, my experience with pudding was mainly the Jell-O ® pudding cups. Most of what we ate as kids was prepared from scratch by my mom, but she didn’t really do desserts (she still doesn’t). So, occasionally, she would let me have Jell-O ® pudding cups in my school lunch. I had never even heard of banana pudding until much later in life — college? later than that? — because, as I’ve mentioned before, I was raised by foreigners. But, I’m so happy that I did eventually discover banana pudding! I happen to love Nabisco ® Nilla Wafers. There’s something very comforting about how simple they are. And, generally, my dessert tastes tend toward the very plain (sponge cakes with chocolate frosting, angel food, custards, etc.). After deciding to focus on comfort food for this blog, I decided that I must make my own banana pudding. But, of course, I couldn’t go the packaged/instant route. I had to make it from scratch. ALL of it. 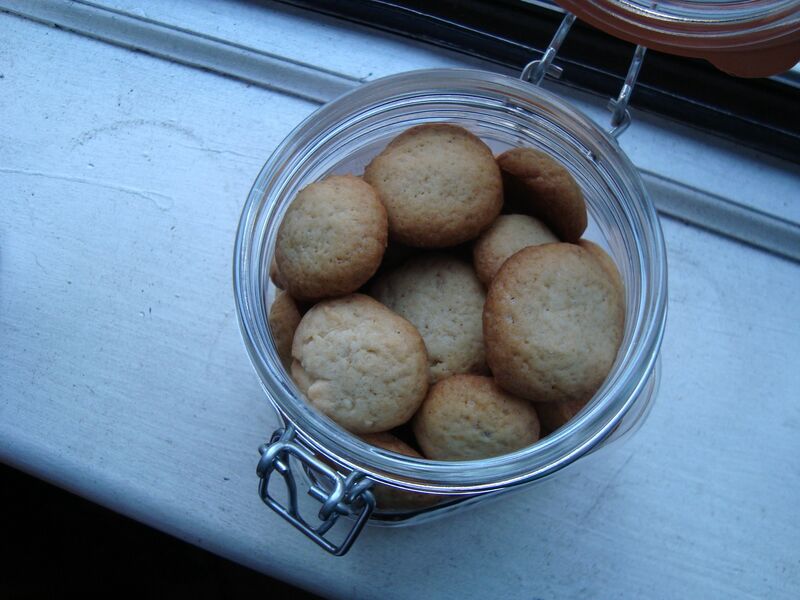 Luckily, Alton Brown did an entire Good Eats episode on banana pudding, including making vanilla wafers from scratch. Hallelujah! So, first, I made the wafers following Alton’s recipe almost exactly. The only deviation in ingredients was that my vanilla sugar has specks of vanilla bean in it (which makes for a lovely looking cookie, picture below). Also, I don’t own a stand mixer, so I used a handheld electric mixer. The cookies turn out more buttery and more complex than their Nabisco ® brethren. Definitely an improvement on the original. *Yes, this is measured by weight. Please do yourself a favor and buy a kitchen scale. I have a digital one , but an analog scale is just fine, too. Just do it. Position 1 oven rack in the top third of the oven and another in the bottom third. Heat the oven to 350ºF. Now, for the pudding part of the banana pudding. Hmmm… I don’t know whether it was me or the recipe (probably a combination of the two), but I wasn’t thrilled with how this pudding turned out. The vanilla pudding was too sweet, for one (and I didn’t even add any banana liqueur, nor did I sweeten the whipped cream). 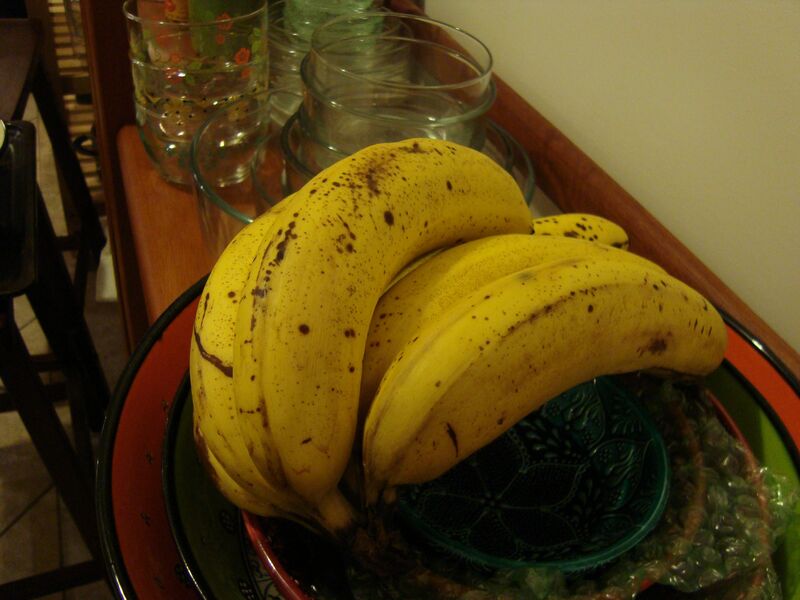 I don’t think Alton calibrated the pudding recipe to account for the ripeness of my bananas. Also, the texture was off, a little grainy — but I’m pretty sure that’s because I didn’t stir the pudding the whole time it was cooking. Remember, kids — CONSTANTLY STIR YOUR PUDDING! thicken and bubble around the edges. Remove from the heat and whisk in the butter, 1 piece at a time, being sure each piece is fully incorporated before adding the next. Whisk in the vanilla extract. Cover the surface of the pudding with a round piece of parchment and refrigerate until the pudding reaches 45ºF, approximately 2 hours. Lay the vanilla wafers on a half sheet pan. Slowly and evenly pour the banana liqueur over the cookies. Set aside for 10 minutes. Toss the banana slices with the lemon juice in a small bowl and set aside. Spread a small amount of pudding in the bottom of a 1 ½-quart glass mixing bowl. 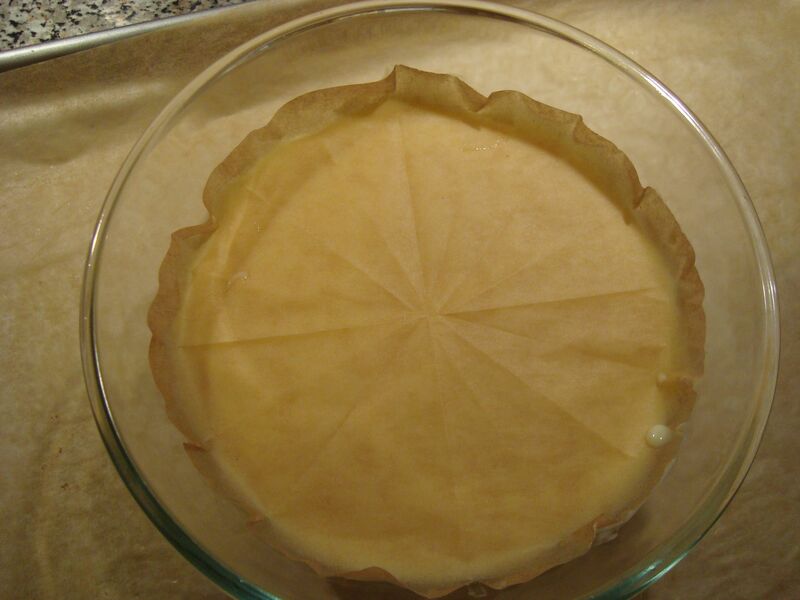 Cover with a layer of vanilla wafers, followed by a layer of banana slices. Spoon 1/3 of the remaining pudding on top of the bananas and repeat, ending with a layer of pudding. Put the whipping cream in the bowl of a stand mixer, add the remaining 2 tablespoons of sugar and whisk just until stiff peaks form. Spoon the whipped cream over the cooled pudding and spread to cover completely. Top with any remaining soaked cookies. Refrigerate for 30 minutes before serving. Store, covered, in the refrigerator for up to 3 days. For more on banana pudding, check out A Sweet Spoonful, and an alternative sugar cookie recipe from My Life Runs on Food. 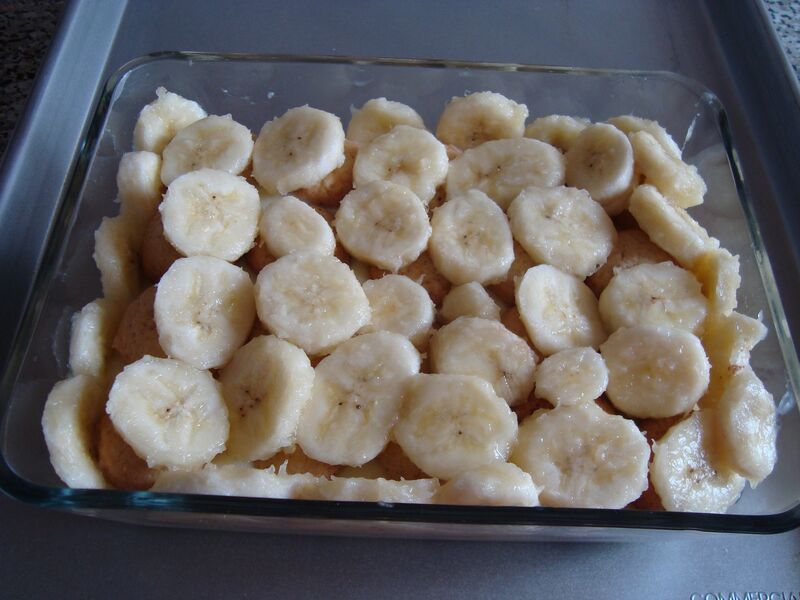 This entry was posted in Recipes, Vegetarian and tagged bananas, comfort food, pudding, recipe, vanilla sugar, vanilla wafers, vegetarian, whipped cream on May 12, 2011 by marinaberger.